Universal Reference Human mRNA is a proprietary blend of amplified high-quality mRNA purified from a diverse set of human, mouse or rat tissues. This reference mRNA provides a common denominator for accurate and reproducible comparisons of gene expression data. 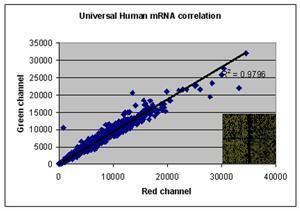 Pooled reference mRNA can be used for multicolor hybridization experiments using DNA microarrays. Ships overnight on dry ice.